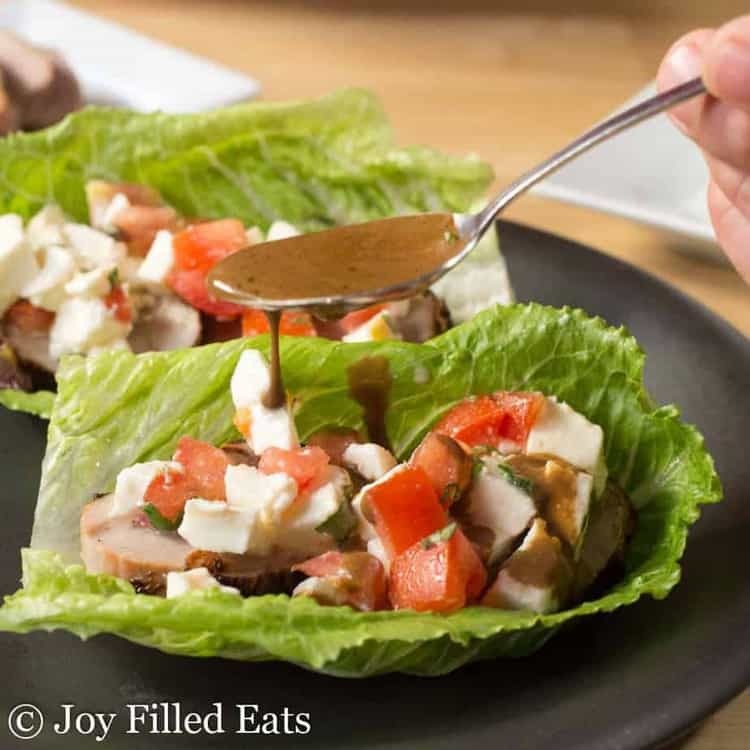 I turned the classic summer Caprese salad into grilled pork tenderloin lettuce wraps. With fresh mozzarella, basil, and garden tomatoes packed into romaine lettuce with the tender pork it will be a new party favorite. Just 7 ingredients and 35 minutes to a delicious light dinner! Grilling in the summer is the easiest way to get dinner on the table, fast, to feed my family of six. With a very busy life, we try to concentrate on being together at mealtimes even with simple dinners or heating up leftovers. It’s being together with my husband and children that is important. 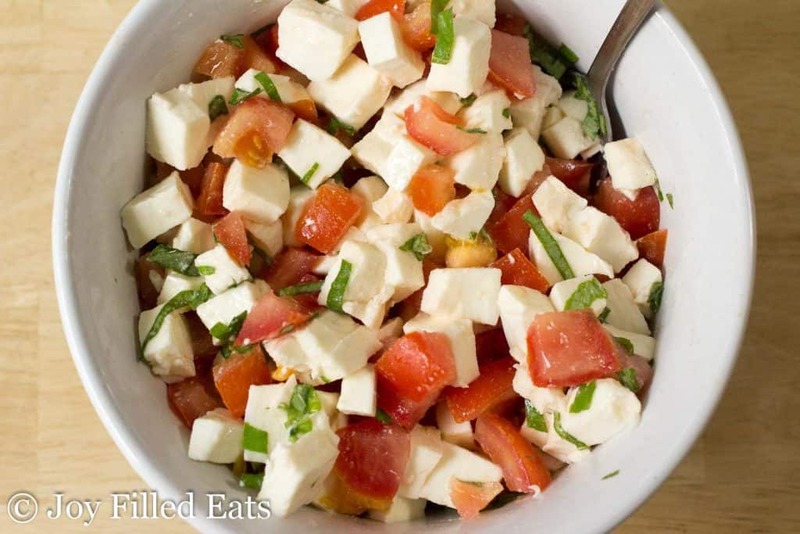 I love the summer flavors of a simple caprese salad. All you need is tomatoes, fresh mozzarella, basil, and a little garlic salt to have a winner condiment or side dish. 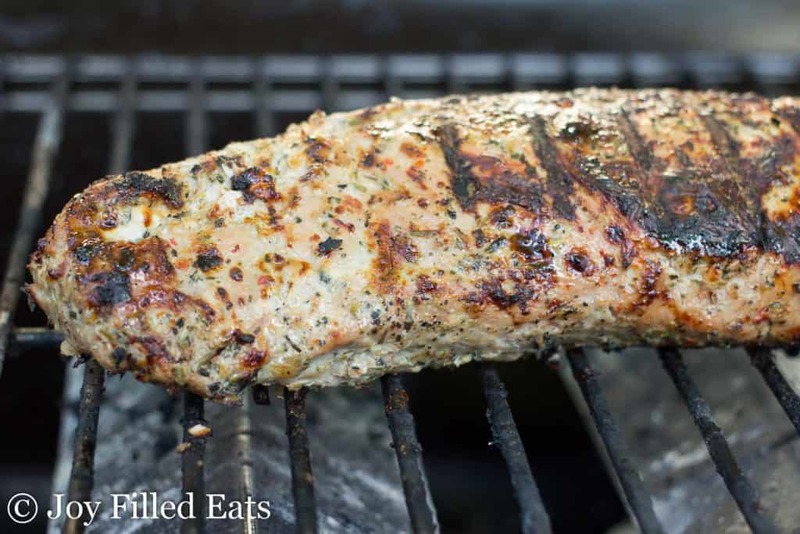 I knew that those flavors would pair perfectly with grilled pork tenderloin. This recipe was super simple. While the grill was preheating I made the salad and dressing. I saved a step and bought a pork tenderloin from the grocery store that already had a dry rub on it. 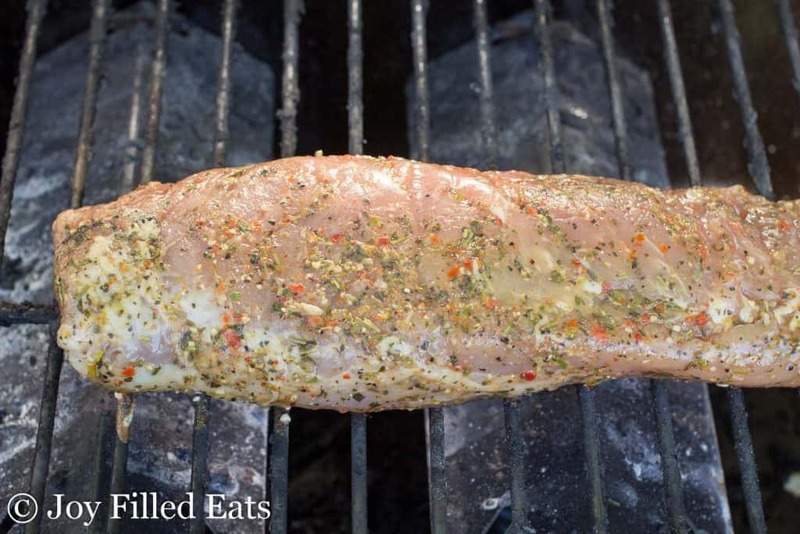 But if you prefer to season your own pork tenderloin any Italian flavored rub will work! With the pre-seasoned meat, I didn’t even need to touch the raw meat. I’m not the biggest fan of handling raw meat. We do the simple cook 10 minutes on medium high on each side and then let our pork rest. I always check the temperature of our meat with a meat thermometer to make sure we aren’t under or overcooking it. I take pork off the heat once it reaches about 153 and then let it rest. It will come up to 155 which is a great temperature for pork. If you prefer to cook your pork well done to 160 go ahead, just remove it from the grill at about 157 and let it rest. The National Pork Board recommends cooking chops, roasts, loins, and tenderloin to an internal temperature of 145° F, followed by a three-minute rest. 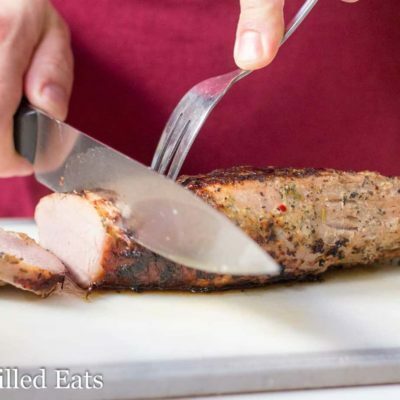 That will get you closed to a medium rare – rare pork tenderloin. 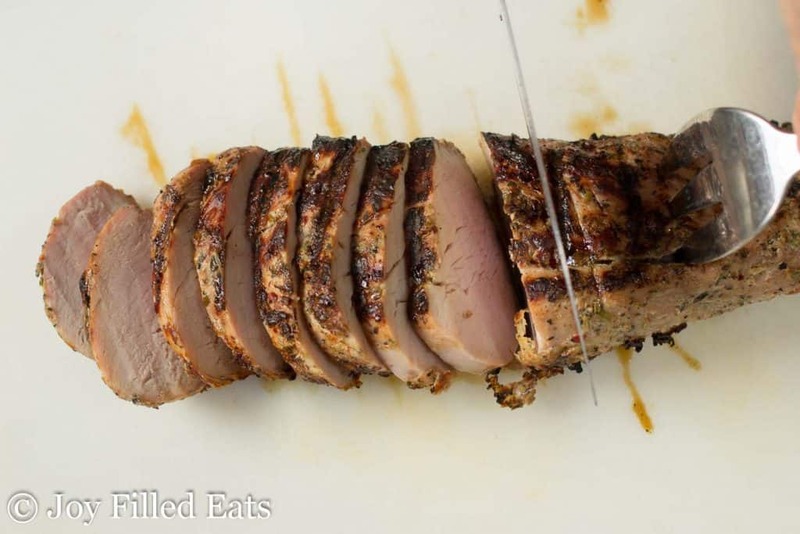 We prefer our pork tenderloin between medium and medium-well. I love how the rub stayed on the meat during the grilling process. It really accented the flavor of the pork. My husband is normally the meat slicer in my house. He is better at it than I am and always ends up with nice slices. 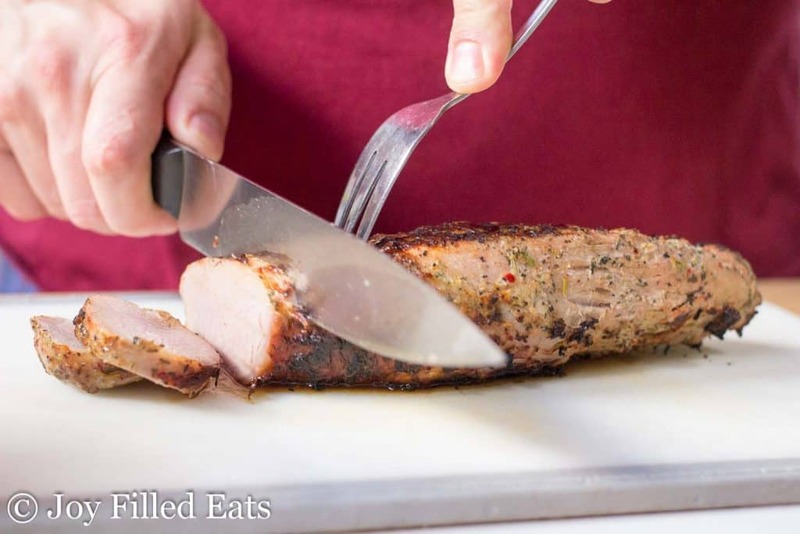 The trick to cutting pork tenderloin is to slice it against the grain. This is a little easier to see what it is raw. You will see streaks of muscle running through the meat. Slicing in the opposite direction of the grain ensures a more tender piece of pork. 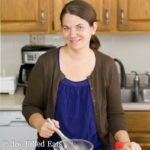 This recipe looks like it has a lot of ingredients and steps but it really is very simple. Just 7 ingredients! You can make this for dinner in about 35 minutes including the prep and resting time. 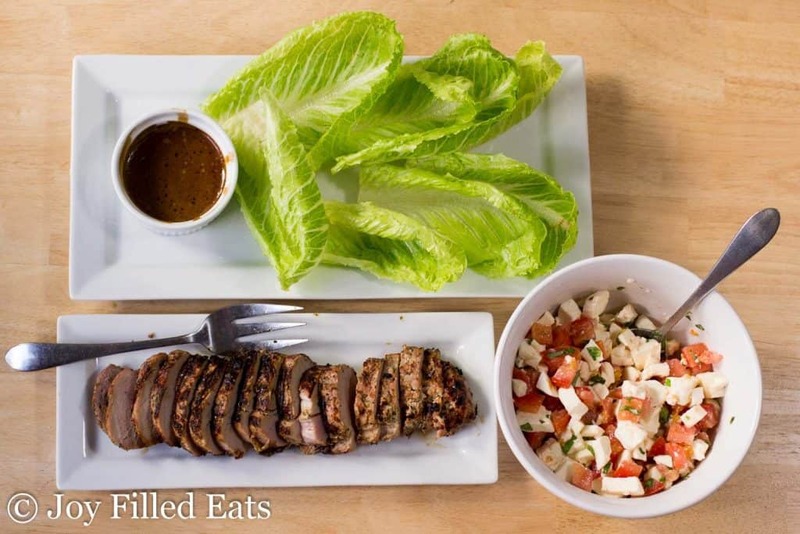 I hope you enjoy these Grilled Pork Tenderloin Caprese Salad Lettuce Wraps! 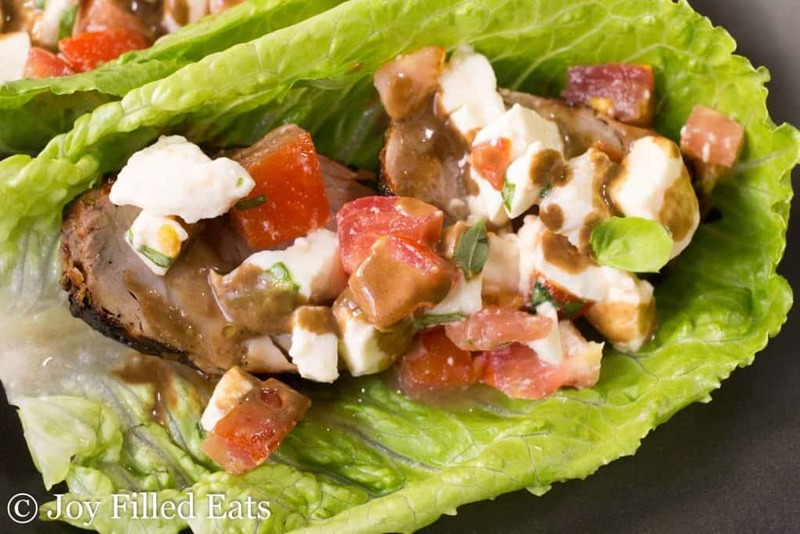 I turned the classic summer Caprese salad into grilled pork tenderloin lettuce wraps. With fresh mozzarella, basil, and garden tomatoes packed into romaine lettuce with the tender pork it will be a new party favorite. Combine the ingredients for the caprese salad and toss gently. Refrigerate while proceeding with the rest of the recipe. Combine the ingredients for the dressing in a small blender and pulse until emulsified. Set aside. To assemble: take one lettuce leaf and top with the pork and caprese salad. Drizzle with a little dressing. Enjoy! Originally Published July 4, 2017. Revised and Republished March 18, 2019. Such a great meal. Love it!